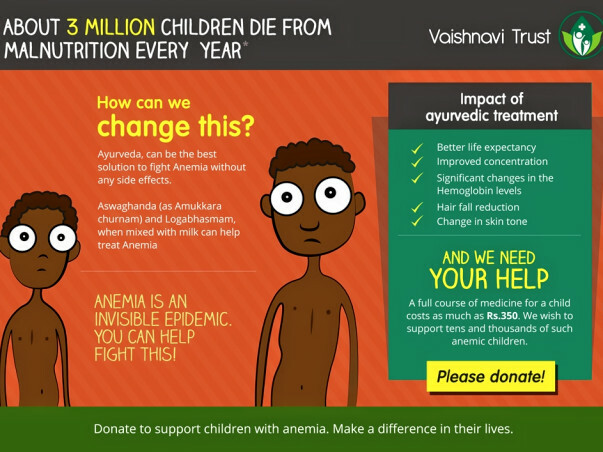 Purpose: To eradicate Anemia in children of India through Ayurveda’s holistic approach. Anemia is a condition in which there is an abnormally low number of red blood cells in the bloodstream. Major symptoms are paleness, shortness of breath, unusually fast or strong heart beats, and tiredness. Anemia caused by a low iron level can affect a child's ability to learn in school. A low iron level can cause decreased attention span, reduced alertness, and learning problems in children. One of the main aims of Vaishnavi trust is to fight such conditions in young children. As per National family health survey 79% of Indian children in 6 to 59 months are anemic. This leads to 48% of children to chronic malnutrition affecting cognitive development on a permanent basis. This is in most part is due to iron deficiency, one of the many reasons of malnutrition. There are many treatments which can act as a quick fix & short term solution for Anemia. Ayurveda has a holistic view of this health condition (Pandu roga) and a long term follow up to improve vitality. 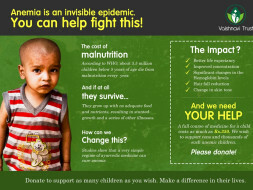 Vaishnavi trust has chartered out a step by step plan to create awareness & help children with this health condition. 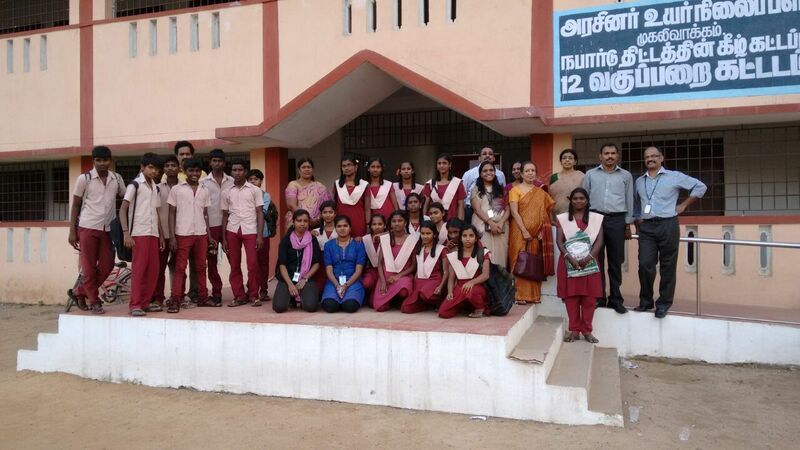 A team of Ayurveda doctors led by Dr.Girija did a detailed qualitative diagnosis and discussion with the set of pilot children to understand their condition and requirement of intervention. It was decided on an Aswaghandha (as Amukkara churnam) and logabhasmam in pure boiled cow’s milk for 30 days and subsequently follow it up with cow’s milk and aswaghandha alone for close to a year. 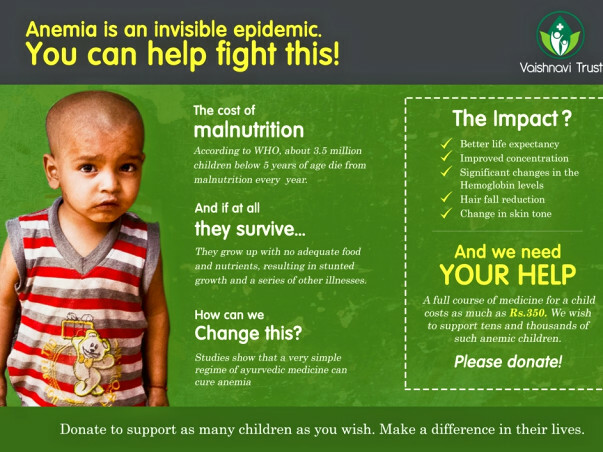 Aspire to reduce the malnutrition due to Anemia by reaching out to 10000 children in 2015 and continue the journey. This fund is for the Initial target of 1500 children. I could not run the marathon due to Visa not getting stamped ontime. however the campaign and efforts continue.